The Photo Palace: Bufflo update No.2 - Anniversary, Niagara Falls, best Polaroid so far and Daguerreotype workshop. Bufflo update No.2 - Anniversary, Niagara Falls, best Polaroid so far and Daguerreotype workshop. My experience in Buffalo definitely deserves another in-depth update, so on my way westward I stopped in a little college town called North East and am going to attempt to summarize yesterdays events. 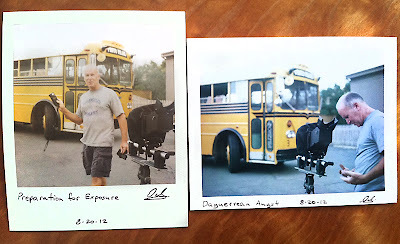 First off I would like to once again say that yesterday was an extra special day because it was on the same date in 2011 that I saw the bus that was to become The Photo Palace Bus in a Frezno CA parking lot and paid the premium price, which she is worth every penny of. In the last year we had some amazing times, she taught me a lot of skills and treated me more wonderfully than I could have ever hoped for. Here's to Gilli-the-Gillig! May she go with ease wherever her headlights point and I hope I'll always be there. As I mentioned in my previous post I did not raise enough funds during the weekend to attend an Ambrotype workshop by Mark Osterman, which is being held right now at George Eastman House in Rochester. I was a bit upset about that, but knew that something will work out and am still determined to come back and take that and many more classes offered by that fine institution. I am a strong proponent of the idea of good things coming to those who believe in them with all their heart, which is something that allowed me many times to go on in the face of adversity. Indeed, during the late Sunday afternoon I received a text message from Mr. Rob McElroy. He was still enjoying the company of his wonderful girlfriend Patsy as they were finishing up his birthday celebrations. He informed me that, if I am not involved in the ambrotype workshop on Monday, I would be welcomed to observe him as he made a few test daguerreotypes. I can't relate to you how elated I was to hear that - ambrotype is an interesting technique, but it is quite a bit less involved than the making of a daguerreotype. I quickly accepted this generous offer and for the rest of the day felt like a bit giddy in anticipation of the upcoming experience. 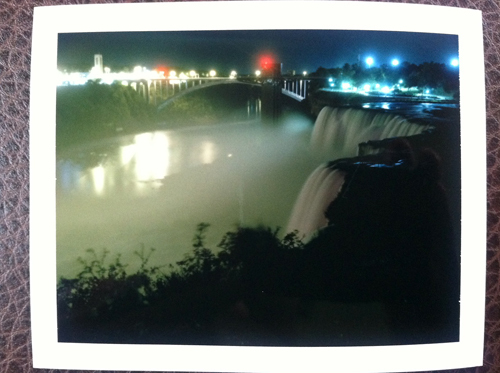 As the night was closing in I packed up my photo display and waited to go see Niagara Falls. I have never been there and went to see them at night to have my own private natural experience free of tourist crowds. That turned out to be a splendid idea and when I got to Goat Island, which lays between the falls on the American side of the border, it was already about 2 am. I had the place all to myself and ws able to set up a tripod and take two exposures - one using a Rolleiflex 2.8F and one with Polaroid 600SE using the Fuji FP100c film that I purchsed the day before from Delaware camera. Here is the result of the Polaroid exposure - I actually waited till the morning to pull and develop it as it was quite cold outside and I wanted to wait until a warmer time to allow the chemistry do all it can on this 20+ minute exposure. I was happy to see the outcome - it actually looks quite a bit lighter and more festive than what I saw, but that's the beauty of the photographic art - it can transform a relatively eerie and overwhelming scene into a quite inviting and festive one. After spending about an hour listening to the rushing water and waiting for enough light to strike the film I headed back into town and parked in the Allentown district of Buffalo just as the bars were closing and their inebriated patrons were starting to stumble home. I heard that Allentown area is the more artsy part of town and was hoping to make some more print and Polaroid sales while waiting for Rob to get home in the afternoon. Buffalo is a pretty slow town when colleges are out and during the day I really didn't get anywhere hear the flow of traffic that I was hoping for. However Gilli did attract the attention of a few art-minded folks and I was able to raise another half-a-tank of diesel mostly via doing instant portraits for $15/pop. As an artist who values every image equally I am actually rather sad to let go of these little 3.25x4.25in treasures, but I hope people will appreciate them as much as I would or more. This is one of the better ones that I produced yesterday and I just had to duplicate it in order to not have it fade away and get lost in the dusty files of my faulty memory. Her name is Rebecca and after talking to me first she actually went home and changed her outfit for this shoot. She was there with her none-less beautiful sister and friend and they walked away with a total of three instant images. They also had a blast using Gilli as a prop and shot a ton of digital photos all around her interior and exterior. I think the above image really does capture the moment well and The Photo Palace Bus' spirit of Photographic Bohemia is evident in it. As afternoon was approaching my heart started to beat faster and I was becoming impatient to see Rob once again and get to witness him in the midst of artistic creation. The flow of onlookers did not allow me to leave my parking spot till just after 5pm and I headed to Rob's place as fast as I could. He instructed me to park right in front of his studio in a little parking lot in which I was unsure that I could turn Gilli around. By the time I pulled up it was actually empty of all but two cars and I was able to pull a 7-point maneuver that left the front facing the exit (always make sure you have a clear way out when traveling in a 35ft vehicle). I was under the full impression that I was about to simply observe the making of a Daguerreotype, which would have been a huge pleasure in itself. Within a minute though I saw Rob emerge from his front door carrying a tripod with a 4x5 camera complete with lens and focusing cloth. This could have only meant one thing, but I still had to ask before the reality of what was happening set in in my brain - Mr. McElroy was about to take a capture Gilli and me; that was his 'test'! I don't know how I managed to pull myself together to take these few images while he was setting up. Rob was working very quickly as the sun was setting and thick clouds were starting to roll across its face considerably cutting down the amount of light. Daguerreotype plates have an approximate ISO rating of 0.1 so Rob wanted to take full advantage of every available photon. The exposures were about 1 minute long and I got to experience what the portrait sitters had to deal with in mid-19th century. It's no wonder you rarely see a lot of smiling portraits from that era - I assure you, even the happiest jolliest person will have a really hard time holding a perfectly still believable smile for that length of time while also trying to hold every other part of their body equally motionless. If you don't trust me try it on your own in front of a mirror. I think overall I did pretty good on standing still and I didn't bother trying to smile, though every part of my inner being was jumping with joy in realization of what was happening. After two exposures were taken we rushed the plates indoors as, according to Rob, daguerreotypes tend to lose contrast the longer one allows them to sit between exposure and development. I have always wanted to see a plate being developed by the action of fumes of mercury. Back in the early days of photography this action was carried out simply by holding the plate over a metal cup filled with mercury with a burner under it. Needless to say, now that the harmful effects of its fumes have been identified, mercury development takes place inside a fume-box with good air ventilation that takes the gas away from the photographer. Rob actually told me a story about one early daguerreotypist who apparently went mad from those fumes and drowned himself in a two foot deep creek by tying a rock to his neck and throwing himself in... I'm glad that the technology has improved since than and that Rob and other people who work in that medium are no longer in danger of losing their minds as the effect of the craft they love. 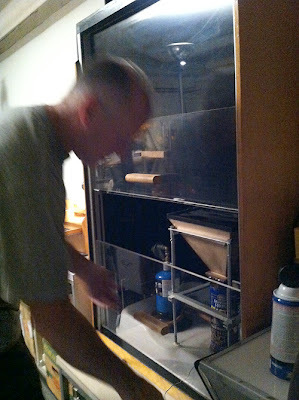 Here is Rob loading the first plate into the fume box and a close-up of his self-constructed apparatus. After the development the plate goes into a bath of Hypo. After several rinses, it gets toned with gold chloride where the contrast of the image is increased. While the plate is suspended in a perfectly level position, the chloride is poured over it and is held in place under its own surface tension. A flame is quickly passed under it evenly heating the combination to a vary certain temperature, which Rob kept careful track of using an infrared thermometer. Here is a vary short clip showing the two images that were developed in rapid succession sitting in plain water baths after toning. You can see that the plate on the left (exposure No.1) had a lot of blue show up in it - that's the early stages of daguerrean solarization and it can be rather beautifully exploited. The last step is drying the plate and that, as Rob put it, is the moment of magic in this process similar to the period of the appearance of a gelatin silver black and white image in a developer bath. Only at that point can the photographer see the full results of his/her labor. Here is a shot I managed to get where you can see the last streaks of water being chased away by a simple hair dryer. Robs images are nearly flawless! Along with having an artistically-oriented soul he is a truly obsessive craftsman. 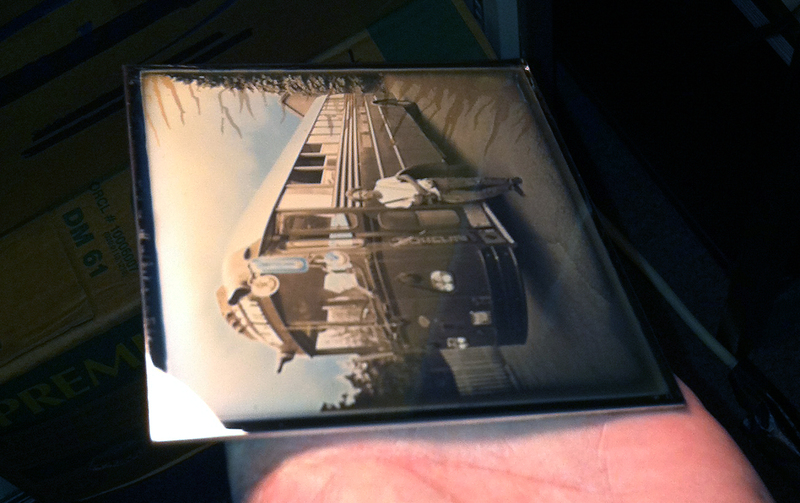 Only that way can one achieve a spot-free daguerreotype image. I invite all of you to visit www.cdags.org and closely examine the work of various artists working with this medium and, after admiring the evaluate their creative merits, go through them and try to find images that are as clean and perfect as those by Rob McElroy. I had a hard time finding any daguerreotypes that surpassed his in that category (I didn't look through ALL of them yet, but I did look at a fair amount). 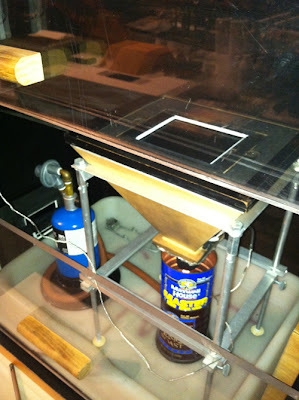 Of course what I described so far were only the final steps of the process. Rob is planning on silvering his own plated in the future to cut down on the cost, which gets pretty high when sending them copper plated to a professional electroplating company. I did get to see the meticulous polishing of the plate, careful sensitization of it with fumes of iodine and infusion of sensitivity with fumes of bromine next as Rob prepared one more plate to be exposed using electronic flash. Rob was the first one to have ever succeed in this technique and now I had a pleasure (and terror) of being his subject under the intimidating set-up of an array of lights that I mentioned in the last post. It appears that when he popped the flash onto my outstretched arm he did not even turn on 1/2 of all the lights that he was going to use this time and I got a bit nervous as I sat behind a modest posing table surrounded by enough lights to light up 10 Winston O. Links train scenes - all about 1.5ft away from me. He had to of course test the light, which requires quite a few pops... Every time he'd say 'close your eyes' I would get an uneasy feeling in my gut in anticipation of the coming wave of light. There was not a single time that he fired the set-up that I did not involuntarily jumped in my seat - the combination of all these light was incredibly powerful and the sound of them going off could be can be compared to being slapped hard on both ears with firm pillows. The action of light was so strong that I started sweating immediately after the first test and one time Robs hand was a little too close to the bank of lights on the side and I could clearly smell burning hair... 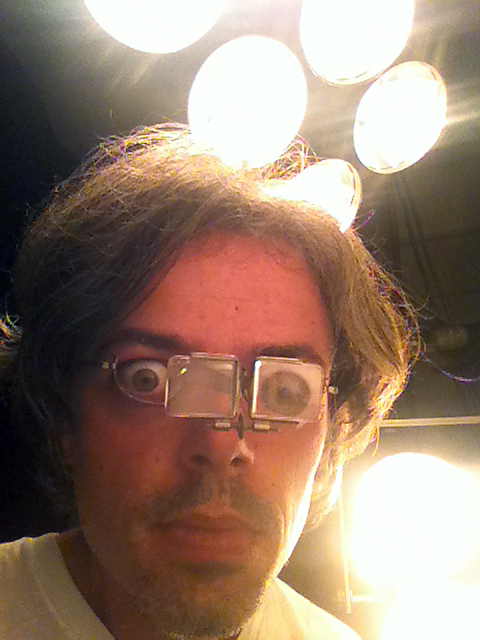 Here I am baffled by my experience and wearing the retouching glasses that I chose to be shot in. Rob did repeat a few times that the process of making a daguerreotype image is a fickle one and sometimes things happen without the knowledge of the artist which result in pretty much utter failure. This was one of those times, but I don't think it was due to anything Rob did carelessly - the image just came out thin and I post it here only as a reminder to myself of the whole experience and not as a show of Robs skills. 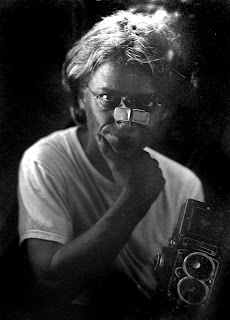 I am not an easy subject to beautify and he did his best... You can see the Rolleiwide that I'm holding in the lower right corner of the frame - I think it was well-worth trying to record this legendary camera with such a noble technique. I do like how a mysterious white clouds that appeared for no reason on this plate alone make it look like my hair is smoking - it very closely relates what I was feeling. The entire process is extremely delicate and tedious, but I saw no sign of it getting to be old for Rob - as he was going through the steps that he must have repeated hundreds of times in his lifetime he explained them to me with attention to detail and clarity that I rarely experienced in all my yeas of education. I did my best to keep as of detailed of notes as I could (that was especially difficult during the steps that have to be carried out under the light of just a few dim amber safe lights), but I will definitely have to come back to him for a refresher course when and if I am ever brave enough to attempt making my own daguerreotype image. Rob, if you read this, Thank You so so much once again for taking me through this experience of a lifetime. I am more energized than ever before during this trip. Now I am slowly but surely making my way toward Minnesota. I think I may stop in Madison Wisconsin as I have very fond memories of that place from 10 years ago. Back then I was traveling with my friend Garry and was raising gas money by for our white Ford F150 Econoline van by making cyanotype prints from Polaroid 55PN negatives right on the sidewalks of various towns and cities. I had a great time in Madison and even was the only featured artist published by the University of Madison in their literary magazine. It is entirely possible that I will not make it there as I am really anxious to get to the YMCA archives in Minneapolis and dig into them in hopes of finding some clarifying information related to the collection of magic lantern slides that has to be a topic of an entirely different post as I-90 and 1000 miles await.